If you’re in charge of running an educational institution, then you should know just how important it is that confidential information does not make its way out to people that shouldn’t hear about them. You want to make sure that the teachers who know about these confidential pieces of information don’t accidentally or intentionally spread the confidential information to anyone that isn’t a part of the institution. You can also like meeting confidentiality agreements. So you’re going to have to come up with an agreement templates that ensures that they don’t. Which is why this article is going to teach you all that you need to know in order to create a teacher confidential agreement that will ensure your schools’ information is protected. You may also see sample legal confidentiality agreements. Remember that the entire point of having this type of document is to ensure that whoever you decide to hire as a teacher will not share whatever information that has been deemed as confidential. No matter what kind of educational institution you’re in charge of, it’s vital that you come up with this type of agreement to ensure that your school is safe from having someone leaking the information, especially if that someone is a person that can easily access it. You may also see sample volunteer confidentiality agreements. At the very beginning, you’ll need to create the title of the document. The obvious reason as to why you would have to do this is because you want the people who go through it to know exactly what it is that they should expect. So as you’re creating the title, make sure to position it at the very top of of the document and make it have a slightly bigger font so that its distinguishable from the other pieces of information. You can also like personal confidentiality agreements. Once that’s done, proceed to creating the title itself. 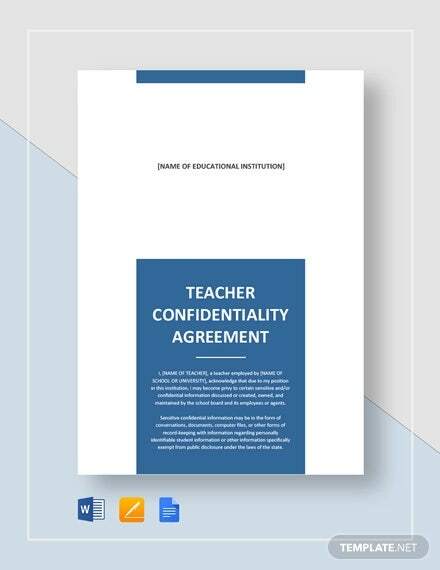 Try to use the standard “teacher confidentiality agreement” as the title as it simple and easy to understand. You may also like creating a confidentiality agreement. In this section of the agreement, you must provide information as to who will be a part of it. The reason as to why you need to identify who will be taking part in the agreement is because it will definitely come in handy when a situation arises where you need to prove who agreed to the terms and conditions that were stated in the document. You may also see sample real estate confidentiality agreements. So the first thing that you will need to do is create a statement which talks about the teacher that will have to abide to the terms and conditions of the agreement. Next is that you want to leave a blank space where the teacher is able to place his or her name. You’ll also want to include information about the school that the teacher is employed in. Make sure that the teacher writes down his or her first name, last name, and middle initial to ensure that you can easily identify who that person is. 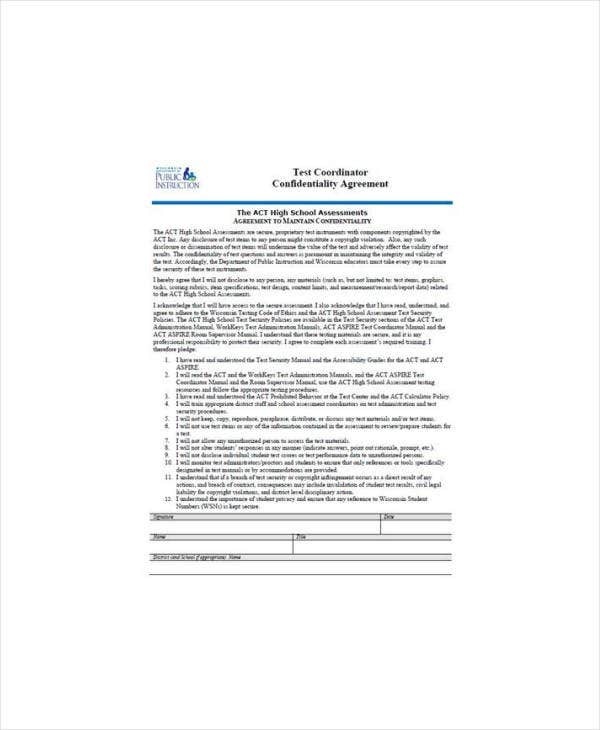 You may also see sample generic confidentiality agreements. Once you’re done identifying who will be involved in the agreement, the next step is to point out what kind of information must be protected by the teacher. The types of information you wish to keep confidential can include any sort of information that might be exchanged between the parties. It’s pretty obvious by this point that the ones you should label as confidential should be related to the educational institution. Basically, anything that you think would do harm to the school should it be leaked must remain confidential. You can also read meeting confidentiality agreement samples. This portion of the agreement is designed to set the boundaries of confidential information without disclosing the information itself. For example, your agreement may list “all documents received”, but you don’t necessarily have to disclose what these documents are until the teacher manages to receive them. You may also see financial confidentiality agreements. This isn’t typically a list of specific things, but broad categories of information that’s basically public information and does not need any sort of protection. It’s really important that you point out what these pieces of information so that the teachers you’ll hire will have an easier time determining what it is that they can share and what has to remain a secret. You may also see data confidentiality agreements. Information that the teacher learns from a third party cannot be considered confidential for the purposes of a confidentiality agreement. Sample confidentiality agreements typically limit the ways the receiving party can use the confidential information provided. The agreement also sets the standards in which the teacher must keep the information confidential. Since we’re talking about making a confidentiality agreement for a teacher that you’ve hired, then you should always consider limiting whatever he or she can do with it. Many basic confidentiality agreements recite that receivers must keep the information disclosed to them in the same way they would keep their own confidential information. However, this can only work of the teacher who receives the information has a known policy for handling confidential information. Other than limiting what they can do with the information, it’s also best that you limit how they can access it. Doing so will help secure whatever information you have so it doesn’t easily fall into outside hands. Such precautions might include, for example, using encryption for emails that contain whatever information that has to be shared with the teacher. You can also read client confidentiality agreements. Your agreement should specify two time periods: the period in which the agreement is going to be made and the period wherein the information must remain confidential. You may also read HR confidentiality agreements. The typical confidential agreement would usually last to around 5 years, but then there are some that would last around 2 or 3. You can always do your research to see how long its duration should be in whatever area you’re located in. You may also see business confidentiality agreements. The end point doesn’t have to be a specific date, but there should be a specific date used as a starting point. That way, the teacher will know exactly when the agreement is going to take place and when he or she can no longer share the information to anyone other than those who they’re allowed to share them with. You may also see legal confidential agreement templates. Another way to set a specific starting date is to have the confidentiality period start from the date the agreement is signed. That way, the teacher knows that once the agreement has been signed, everything takes effect immediately. 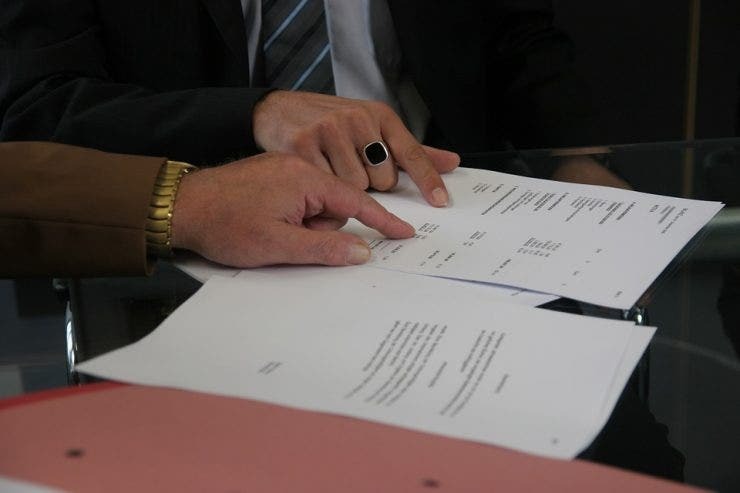 You may also like confidentiality agreements for business. You can also state that the confidentiality agreement may end when a certain event occurs. An example of which would be if you make the confidential information into public knowledge. This can effectively halt the agreement and the teacher will no longer be bound to its terms and conditions. You may also see meeting confidentiality agreement samples. There’s always that chance that the teacher might break the agreement despite signing the document. So to make sure that this doesn’t happen, you can set legal penalties for those that decide to break the agreement. While you can set the penalties yourself, you can also leave the decision to a judge or arbitrator. You can also like sample celebrity confidentiality agreements. How detailed you want to get with penalties generally relates to how unique the information being disclosed is, and how much damage it can do or does when it’s leaked. You can also see joint confidentiality agreements. The more difficult something is to value, the more likely there is to be a clause listing a specific dollar amount in damages for breach. If both parties can agree to the value of the information, then they won’t have to go to a judge to help them figure out the amount. You may also see volunteer confidentiality agreement samples. This is the last section of your agreement and it’s very important. You want to create spaces where both you and the teacher can place your signatures in the document. The reason as to why these signatures are needed is because they’re proof that the parties involved have agreed to all of the terms and conditions that are contained within the confidentiality agreement. You may also see sample client confidentiality agreements. The teacher’s signature is definitely something you want in the agreement because you’ll never know when a situation may arise where you have to prove that the teacher agreed to the confidentiality agreement. Once you’ve managed to get the teacher’s signature, make sure to keep this document in the personnel files to ensure that you can access it whenever you need it. You may also see patient confidentiality agreements. If you would like to learn about the other types of confidentiality agreements that you can possibly make, then all you have to do is go through our site. It has the many different articles that should be able to give you whatever help you may need. The only thing that you to do is to read these articles thoroughly so that you can make effective use out of whatever information they provide you with. You may also see simple confidentiality agreements.